After the blazing victory of Gilas Pilipinas, against India last Tuesday, they faced Iran, the giants of Asia, and fell short at 68-63. Coach Chot Reyes and the Gilas team, together with the fans were understandably dejected but not before they had given a good fight and tired out the Iran team. Unlike their start in their last game, Gilas seemed to have a hard time in the first quarter. Tenorio, Chan, Norwood, Douthit, and Pingris made up the starting line up and they were unable to stop Iran from having the first basket for three points. Gilas seemed to have holes in their defense as Iran shot more points. First quarter seemed not to be for Gilas since it ended at 29-17 in favor of Iran. Filipino fans could not contain themselves as they cheer on the Gilas team. Soon they were able to patch up their defense and gave Iran harder time to take shots. Lee entered the hard court at the start of second quarter, shooting two points with ease followed with a three by Dillinger. Tenorio was able to shoot both free throws and Chan shot a three pointer. Halftime ended with score 36-34, shortening Iran’s head by 2 points. Third quarter started with Lee’s three points then he followed it with two on the fast break, giving Gilas the lead of three points 39-36. Iran had two shots in free throws and gave a run on fast break to shoot another two points. Iran is back on the lead at 43-41. However, Tenorio swiftly countered with a two triples grabbing back the lead for the Philippines at 47-43. Iran tried to get back the lead and kept of attacking the basket gaining 4 more points. Third quarter ends at 53-50 with Gilas holding out the lead. Watch Live Streaming Philippines' Gilas vs Iran brought to you by TV5 below..
Fouth quarter started with Douthit trying to dunk the ball but was called with an offensive foul against Iran’s Hadadi. Pingris was back in the game with Iran still down by three. Pingris shot two with alley-oop while Hadadi failed to get through the Gilas defense and get back with more shots. Time-out was called with 6mins and 35 secs remaining, scores at 59-53. Game resumed with Pingris on free throws missing the first shot. June Mar tried to shoot from under the basket but was called out with traveling. Iran’s point guard Kamrani took back their lead at 61-60. Pingris grabbed the ball in rebound but June Mar was called out for offensive foul. Douthit missed the shot and score was tied at 61. Norwood shot two for free throws in the last two minutes. A minute left, Gilas and Iran tied at 63. Iran’s Bahrami was able to shoot a free throw, gaining a point lead. Douthit was back in the game and Bahrami shot 2 free throws gaining more lead for Iran at 66-63, 27 secs before the game ends. Gilas tried to call foul but to no avail. 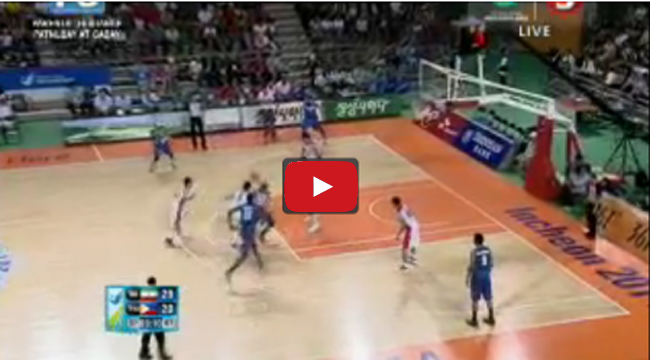 Douthit tried a three but misses at 2.2 secs remaining and no more time out for Gilas. Iran was able to basket two more free throws and won against Gilas at 68-63. Tomorrow Gilas will have another game tomorrow "Gilas vs Qatar". Details will soon be posted. Follow us on Facebook and Twitter.